Today: Why you should start thinking of breadcrumbs as a condiment -- and bringing them with you to work. 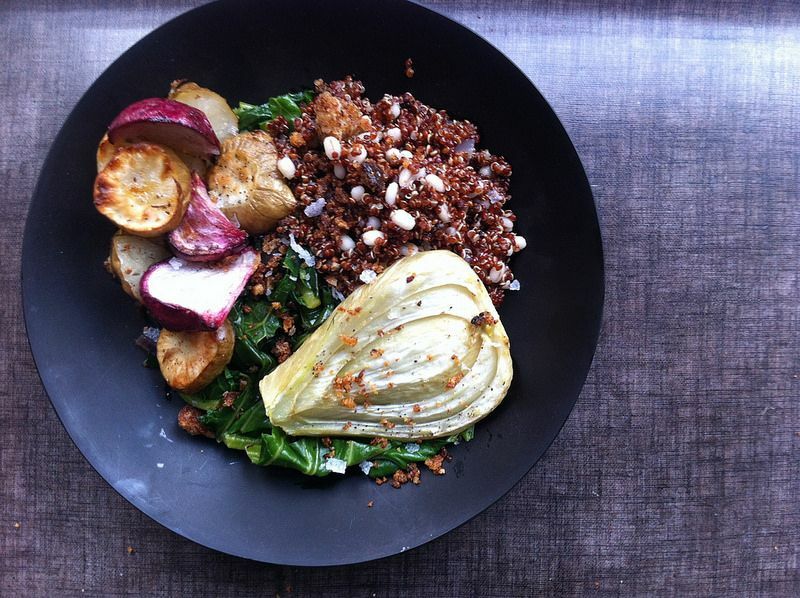 Yes, you are correct in observing that this is another bowl of vegetables and grains and it is not totally discernible from the majority of other lunches that our editorial team throws together, often haphazardly, on a daily basis. But wait! Do you see what's different here? Do you love playing photo hunt games at dive bars? So do I. Let's pick out the new trend, together. More: Watch Amanda make breadcrumbs at home. This lunch -- heaps of grains swaddled in sautéed greens and weighed down with roasted vegetable chunks -- would be just fine on its own, but Brette brought in a breadcrumb surplus from her latest dinner party, and threw our palates a fast one. Crunch and oil and salt and breadiness make everything better, of course, and now we know: Whenever you make breadcrumbs, make a lot. And bring your extras to work. Your lunches will be all the better for it. This is one of my favorite ways to spruce up a dish. For something a bit different, I like to process a sheet or two of dried nori in with the breadcrumbs. I got this idea from Yuji Ramen, it ups the umami factor and is great on seafood dishes!